In the aftermath of Hurricane Maria, the September 2017 climate change-fueled disaster which devastated Puerto Rico and left over 3,000 people dead, the island’s electricity grid was left decimated. As the island rebuilds, the oil and gas industry, industry-funded think tanks, and their legislative allies have begun a concerted push to flood the island with liquefied natural gas, or LNG. But a century-old federal shipping law known as the Jones Act stands in the way of those ambitions. LNG is super-chilled methane gas obtained via hydraulic fracturing, or ‘fracking,’ a horizontal drilling technique decried by environmental justice advocates for its public health impact on communities across the country. The method can contaminate nearby air and water with toxic chemicals that have been linked to increased risk of cancer, birth defects, and respiratory issues. Once chilled, the LNG is shipped from ports on tankers and taken throughout the world. The U.S. has transformed into an LNG exporting powerhouse, sending over 5 billion cubic feet per day to the global market in 2018—or over 60 percent more than was exported in 2017. Climate scientists have also sounded the alarm about the natural gas supply chain and its potential to leak methane into the atmosphere. Methane is a greenhouse gas 86-105 times more potent than carbon dioxide as a heat trapping agent over a 20-year period, the key period during which most climate scientists say major action must be taken to combat the potential ravages of climate change. Despite these concerns, the Trump Administration’s Department of Energy has eased the way for LNG export companies to ship gas to Puerto Rico and the Caribbean at large by classifying tankers as “small scale,” as reported by The Real News. That category has exempted them from the more robust and routinized federal environmental review process by considering the entire class of carriers in the “public interest,” as defined in the Natural Gas Act of 1938. The “small scale” variety of tankers, and the companies which own them, have their eyes set in particular on the Caribbean. That is spelled out explicitly in the Energy Department press release announcing the rule change. And as it stands today, few LNG vessels are manufactured in the U.S. Under the Jones Act, ships from other countries cannot move cargo from one U.S. port to another. Because Puerto Rico sits as a “dependency” of the U.S., or what many call a colonial outpost, the Jones Act applies to shipments from the mainland to the island. 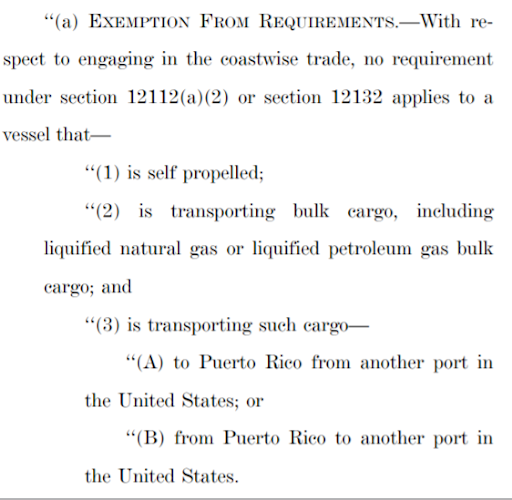 From this milieu, a campaign has emerged to create an exemption to the Jones Act as it applies to the U.S.-Puerto Rico relationship. LNG, and the oil and gas industry at large, could stand as the central beneficiary. Advocacy for overturning the Jones Act in Puerto Rico predated Hurricane Maria. But in its aftermath, it has taken on new life, particularly as it relates to LNG. 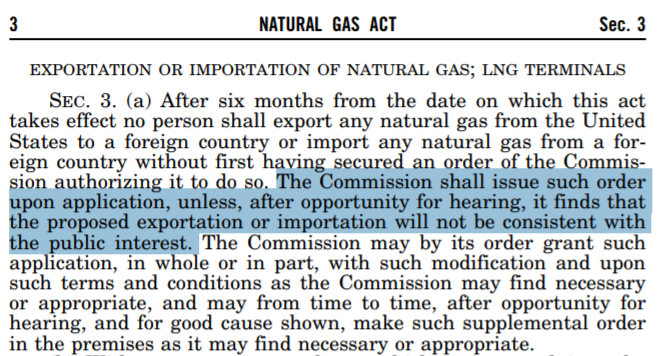 Hawaii first introduced the idea of an exemption for LNG in 2013 in the form of House Concurrent Resolution 150 and House Resolution 119. Shortly thereafter, Puerto Rico’s U.S. Rep. Pedro Pierluisi introduced his own version of that resolution in the U.S. House of Representatives as H.R. 2838, the Puerto Rico Interstate Commerce Improvement Act of 2013. 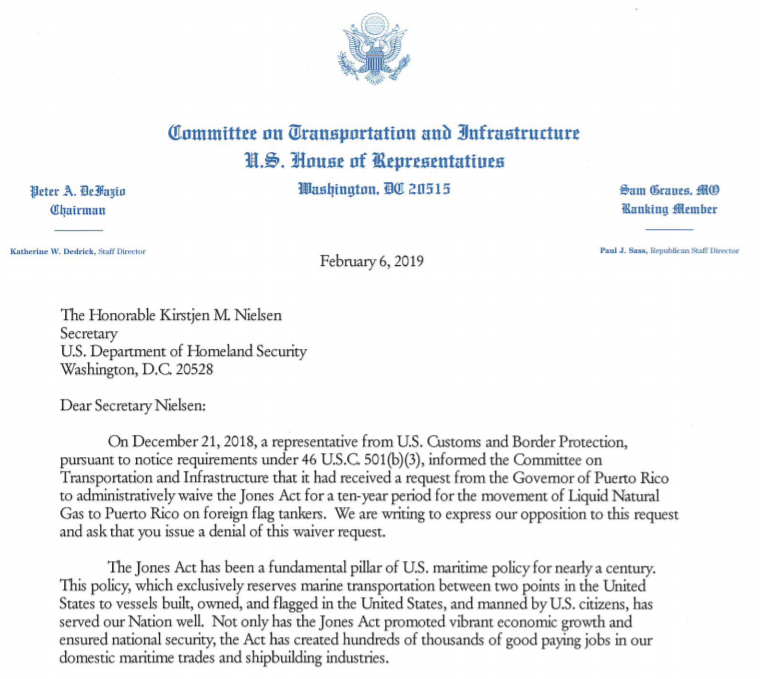 More recently, U.S. House Committee on Transportation and Infrastructure leaders published a letter in February of 2019 detailing that the governor of Puerto Rico, Ricardo Rosselló, applied for a 10-year Jones Act permit exemption back in December of 2018. In the letter, Committee on Transportation members expressed concern with the proposal, along with the fact that the Trump Administration has taken a liking to the idea. At a Subcommittee on Coast Guard and Maritime Transportation hearing on March 6, DeFazio singled out the oil and gas industry as the entity pushing the hardest to undo the law for its own self-benefit. The Trump Administration issued a temporary 10-day Jones Act waiver as a post-Hurricane Maria disaster relief measure, making it easier to bring supplies to the island, and is now mulling over nixing it permanently. At the Argus Crude Summit in Houston on January 24, Harold Hamm—founder and CEO of shale oil drilling giant Continental Resources, as well as President Trump’s 2016 campaign energy adviser and a major donor to his campaign—also came out in support of a Jones Act waiver as applied to LNG. Corporate-funded think tanks, too, have chimed in on the issue. The Cato Institute, a longtime recipient of fossil fuel industry donations co-founded by Republican Party mega-donor Charles Koch, has joined the chorus of support for a Jones Act exemption for Puerto Rico. So has another group founded by Charles Koch, the Institute for Energy Research, which published a 2017 report in support of a repeal as Hurricane Maria annihilated Puerto Rico. Critics of the potential LNG import exemption say they see the events unfolding through the lens of colonialism. One of them is Catalina M. de Onís, an Assistant Professor in the Department of Civic Communication and Media at Willamette University. “This exception epitomizes how corporate energy interests and their political allies are willing to waive one aspect of an arbitrary law only to the extent convenient for them, rather than addressing widespread calls from civil society to lift this act entirely to transform Puerto Rico’s dependence on U.S. ships and imports,” she told The Real News. Crowley, according to OpenSecrets.org, is one of the top donors to Puerto Rico’s non-voting member of the U.S. House of Representatives, Jenniffer Gonzalez, a Republican. Gonzalez—host of a recent two-day LNG summit attended by diplomats and industry representatives from around the world—has received $12,900 in campaign contributions from Crowley since her 2018 run for Congress. 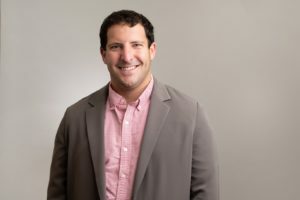 Causes and Consequences of the Privatization of Puerto Rico’s Public Electric Authority after Hurricane Maria,” who now works as an account manager at the company CivicSolar. On top of Governor Rosselló’s decision to apply for a 10-year Jones Act reprieve for the LNG trade, the Puerto Rico Electric Power Authority (PREPA) approved building three additional LNG import terminals for the island in its Integrated Resource Plan (IRP). It’s a decision which has come under fire even by its own union, Union Trabajadores Industriales De Puerto Rico (UTIER). Instead, UTIER sees the crisis as a chance to create a new reality, one based on solar energy.